A new challenger for the wireless crown. We will readily admit to being fans of wireless speaker-maker SONOS here at The Master Switch. While you’ve got to be really comfortable with being locked into a single audio ecosystem, for sheer ease of use, we’ve yet to experience anything that can beat them. That doesn’t mean we’ve stopped looking for such a challenger; quite the opposite, in fact. So we were really, really excited to unwrap speaker maker Paradigm’s PW 600. In this review, we break down the PW 600’s sound, design, packaging and accessories, specs and more. To see how it stacks up, see our list of the best wireless and Bluetooth speakers. The Paradigm PW 600 - part of Paradigm’s SHIFT collection - sounds genuinely incredible. Once you do the calibration, of course. Before calibration, it offered perfectly competent, albeit slightly broad-strokes, sound. After calibration? It blew our minds. It was like slipping on a pair of corrective lenses, where before everything was blurry and out of focus. The imaging here was just extraordinary. We were able to pick out the tiniest details of the mix, even when things were frenetic, and although it’s never going to beat a full surround sound system or 7.1 home theater setup, it offered a significant soundstage that felt like it enveloped the room. Articulation at all ranges of the frequency spectrum felt clear and concise, even in the low end, which wireless speakers can sometimes render a little muddy. And boy oh boy, does this thing get loud. Hardly surprising, at 400 watts – wattage may not be an exact analog for volume, but it’s a good rough guide. This thing can certainly crank up the noise. And, like we said, there was virtually no loss of detail when it did. Here at TMS, we’ve listened to a hell of a lot of wireless speakers. The standard is almost universally decent, particularly once you get past the $400 mark. But in our opinion, the PW 600 is one of the best-sounding, if not the best-sounding, speakers available right now. It might come up short elsewhere, but this is one area where it truly excels. It’s worth noting that Paradigm offer a bigger version of the speaker, the PW 800, which offers all the 600’s features with an additional 30 watts of RMS power and 60 peak. We haven’t had a chance to test that one yet, but we are going to go out on a limb here and say that it’s just as good. Seriously: you gotta hear this thing. The 800, by the way, is slightly more expensive - $799 at the time of writing. The sound may be good, but the actual experience of setting up the speaker was a disaster. The problem starts when you try to calibrate the PW 600. Now, in theory, this is an excellent idea, and it was a pleasant surprise to see that Paradigm has packaged an Anthem Room Correction microphone in with their speaker. The concept is simple: you connect the microphone to your PC or laptop via the included USB cable, boot up the software, then hold the microphone in your listening position for a minute or two while the speaker plays a series of tones. In doing so, it will have adjusted to the layout of your room, and the sound will be optimised. Or it will be, if you have a PC. See, the ARC software doesn’t work with Macs. At all. There is an iPhone app, but if you own a MacBook, or an Android phone, you’re right out of luck. The only way to get the software running on OSX is to employ another piece of software called Boot Camp, which replicates a Windows environment on a Mac, and that is just insanity. While we realise that the majority of global computer owners have PCs, Apple still have a significant market share - crucially, we imagine that that market share coincides with the type of people who Paradigm want to sell this wireless speaker to. The realisation that you need an entirely separate computer just to calibrate your system correctly is a bit of a crushing feeling. For Paradigm and Anthem not to have made a plan for this is crazy. This is the main place where they fall to SONOS: the latter may not offer the room correction exactitude of Anthem, but at least you’ll never have to stop and check what type of phone and computer you have before using it. And the setup of something like the SONOS PLAY:3 (full review here) easily eclipses it. If you want an easier setup process, go for that: it’s cheaper, too, at around $249. Good news: we had a PC on hand, along with our regular Mac setup. So, we were able to get the room correction working well. We’ll talk about the results in the next section, but once we’d actually installed it and got it running, it was easy and intuitive to use. No worries. Unfortunately, there’s an unpleasant coda to this. The PW 600 is a Play-Fi system, which means it uses a brilliant piece of engineering that slides it into a family of multiple speakers from multiple different manufacturers. The use of Play-Fi means that these speakers can all play the same audio at once, regardless of who made them. If you own certain speakers from Klipsch or Pioneer, for example, you can get your PW 600 on the same network very easily. It’s a neat idea, and it works well, and we do want to stress that Paradigm aren’t really responsible for what we are about to say next: the Play-Fi app is horrible. Borderline unusable - glitchy and complicated. This didn’t turn out to be too big of a problem, as the PW 600 is perfectly capable of something like Spotify Connect, meaning we could play it directly from that particular app. But we had to use the Play-Fi app to connect the speaker to our network, and that was no fun. If you find yourself easily annoyed by finicky apps, or you don’t own a PC or iPhone, you may want to steer clear of this one. The Paradigm PW 600 is a relatively hefty beast, weighing in at 7.5lbs. It comes in either black or white (ours was the latter) and although its shape and design doesn’t do anything particularly new or groundbreaking, it works well enough. The speaker slotted well into our room without calling too much attention to itself, which is something we look for in wireless speakers. Although there is no issue positioning the speaker either on its side or on its end, we decided to stand it upright for the majority of our testing, as we felt this gave us better access to the buttons. These are arranged along one side of the unit. There’s a power button, two volume buttons, a mute switch, and input selector – all of which are easy to find without looking, and all of which have a pleasing click when you push them. There’s a Wi-Fi signal indicator above them, which is always helpful. In terms of actually using the controls, we found that there was no problem when using them on the device itself. Controlling things via an app was a little bit more…problematic. Hidden round the back are a whole range of intuitive and feature-rich controls. Aside from the power socket, there’s a Wi-Fi setup button, an output for a subwoofer (something the SONOS speakers don’t have, although they do offer a wireless sub option) and a 3.5mm analog input. You also get an Ethernet input, and a clever switch that lets you change from stereo to mono, for when you have two Paradigm speakers. So far, so good – this is all stuff we expect to see hidden, as it’s the kind of thing we’d only use once before forgetting about. We also recorded zero Wi-Fi dropouts - no matter what happened, the PW 600 always found us. The slightly boxy design and plastic housing isn’t going to raise pulses, but it gets the job done, and the controls are well-thought-out enough that you’ll never have any issues using them, or understanding what they tell you. The fact that they light up with a warm, comforting glow, accompanied by various blinks and pulses to help you translate what’s going on, is a welcome addition. The main accessory here is one we’ve already mentioned: the Anthem Room Correction microphone. It’s a cigar-shaped- and -sized black tube, which easily connects via USB to a laptop or PC (there is a cable included). As accessories go, it’s obviously the key that unlocks the PW 600’s amazing audio power, and it’s a welcome one. You probably won’t find you need it very much after the first time you use it, but it’s worth keeping around – not only because you’ll want to recalibrate things if you move the speaker, but also because there are plenty of other pieces of audio equipment available that use ARC, and a calibration microphone can be a very handy thing to have. Beyond that, accessories are minimal and functional. You get a power cable, which is long enough for all but the most demanding listeners, and an Ethernet cable for when your Wi-Fi network is playing up. There’s a slightly dense owners manual too, which can often be confusing, and which we’d like to see improved. We must say that we quite enjoyed the packaging. The turquoise color scheme (if it really is turquoise, and we haven't mistaken it for another color) really sets it apart, and the cardboard slipcover over the main box gave it a luxury feel. Again, this isn’t going to blow your mind, but it's adequate. After room calibration, the Paradigm Shift PW 600 offers extraordinary, detailed sound. The design of the speaker is simple, but effective. ​It offers huge value-for-money, once you get past its quirks. The calibration software only works on PCs and iPhones. This speaker depends on Play-Fi, which has one of the worst apps we’ve ever used. ​Doesn’t dethrone SONOS, which is still the king of wireless speakers. First pick. The SONOS PLAY:5. Kind of obvious, isn’t it? 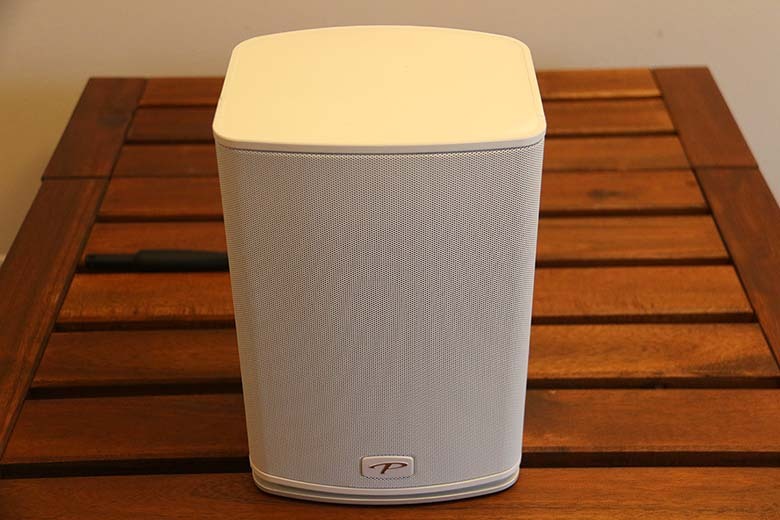 All the same, this is the direct competitor for the PW 600, and the current holder of the wireless speaker crown. Fortunately, making a choice between this and the speaker under review here should be relatively straightforward. PLAY:5 pros: Setup is a breeze, and using it as a real pleasure. The sound is excellent. Cons: excellent it might be, but it’s not quite as good as that of the PW 600 – and there’s no Play-Fi, meaning the only other speakers you can connect it to are those made by SONOS themselves. If that’s OK with you, then we think this should be your first choice. We still prefer it over the PW 600, albeit narrowly. It’s also only slightly more expensive: $499 to the Paradigm’s $360. Say what you like about the PLAY:5 and PW 600 – they’re not exactly lookers. The B&O Beoplay A6 is. It’s one of the coolest looking speakers we’ve ever seen: a fabric-covered wonder that will appeal to design-heads more than any other option here. The problem is that it’s very expensive – just under $800 – and despite having three Class D amplifiers inside it, it doesn’t do nearly as good a job as the PW 600 in terms of detail and soundstage. Still, it’s a viable option, especially if you want it to work with the room, and not just in an audio sense. Or how about the Audioengine HD6? Not an obvious choice – but, we think, a good one. These may be less wireless than the other options, requiring a cable connection between the two speaker channels (and there's Bluetooth only, no Wi-Fi) but if you want a set of bookshelf speakers that sound fantastic and look great, then these should be the first ones you go for. They may be a tiny bit overpriced right now ($699, compared to the Paradigm’s $360) but Audioengine have an excellent pedigree, and if you want better stereo spread than the options above can give you, take a look at the HD6s. If you want some of that Paradigm goodness, but don’t care for the size, why not try one of their smaller speakers? The PW 300 only has 80 watts, compared to 200 RMS for the PW 600. And, be warned: you will only be able to use the room correction in conjunction with Paradigm’s PW wireless soundbar. That is, to be honest, a bit weird. Our take? If you really value sound, buy the bigger speaker; otherwise, this should be fine.